A contingent of all the three wings namely Army, Navy and Air Force, presented an impressive “Guard of Honour” to the RRM on his arrival. NCC cadets thereafter presented a fine band display. Dr Bhamre also visited the ‘Flag Area’ prepared by the NCC cadets, depicting various social awareness themes and cultural activities. The cadets briefed the RRM in detail about their respective State Directorate themes, aimed at national integration and development. The versatile NCC cadets then presented a spectacular Cultural Programme in the NCC auditorium, comprising of group dances and ballets, showcasing the rich cultural heritage of our Nation. Dr Bhamre complimented the cadets for their smart drill today and appreciated the commitment of NCC to ‘Groom Future Leaders’. Highlighting the mass appeal and Pan India footprint, he lauded NCC for its vital contribution in Youth Empowerment and Nation Building. On arrival, the RRM was received by Director General NCC Lieutenant General P P Malhotra. 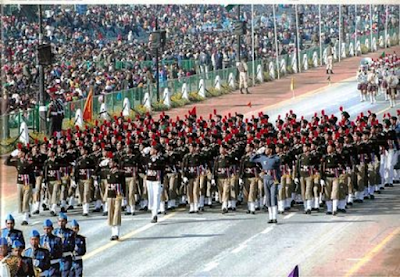 The RD Camp is being 2,070 cadets including 698 girl cadets drawn from 29 States and seven Union Territories are participating in this Camp, which would be culminated with the Prime Minister’s Rally on January 28, 2019. In addition a total of 101 foreign cadets from ten friendly foreign countries are participating under the NCC Youth Exchange Programme. The cadets attending the Camp are participating in a number of activities, like cultural programmes, national integration awareness and institutional training competitions.